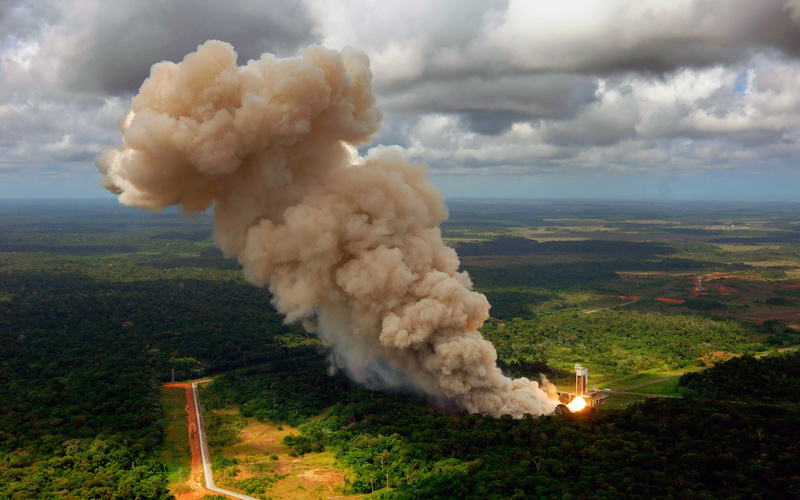 The European Space AgencyÂ’s next generation Â‘budgetÂ’ launcher, Vega, undergoes its first static firing test at the Guiana Space Centre, EuropeÂ’s Spaceport, in Kourou, French Guiana. The original ESA image can be found here and has been given the usual enhancements and reformatting for Caedes. Wow, such great clarity. I saw this in the booth and just had to stop by and tell you what a 10/10 it is. Awesome photo and great clarity,thanks. I didn't know Vega's burned like that - over here it was Ford Pinto's. Good job, Phil. Do you know when Vega will be trully launched? now thats fantastic! Hope I get it in VB. I cant get over how high that pillar of smoke goes up. Very very new to this, and only have a bog standard fuji 2mb digi camera. Pierre – the first flight of Vega has been put back until mid 2008 from its initial planned launch at the end of this year. This isn’t entirely surprising as ESA are very busy at the Kourou site including preparing the new launch facility for the Russian Soyuz rockets and getting the new automated service vehicle ready for launch on a modified A5 ECA rocket that will take over supply and maintenance duties for the International Space Station when the Shuttle retires in two years time. WHOA! Thanks for sharing this one. I do like your enhancements much better than the original. Mighty fine work. Somewhere in between lies a really great rendition. Wow, I had a look at the original and now I gotta give credit. The touch-ups and changes are superb, just top-notch! The original photo is so nonchalant, you made it live.